We explored absorption and color mixing, water freezing and ice melting; played with water and paint, observed float or sink, stacked plastic cups. Several summer sensory activities in one were led by a child. That made the experiments and discoveries unexpected fun! Well, we did make ice boats too - short lived, but leaving bright memories behind. We started with stacking cups activity. It's awesome for kids of all ages. At this early stage, I offered cups, showed that they can be stacked, and let My Firefly explore the ways of stacking by herself. She loved this little free play with cups! Next we filled cups with water for color mixing. The cups set up on a paper towel on a tray. It made this sensory play mess free. She started painting paper towels using colored water from the cups. When the towel was all wet, I offered her the paints. Painting wet towels is a great opportunity to explore colors and color mixing. I tried to catch a moment when the paper towel was getting just a little bit too much paint. That is a perfect moment to offer a fresh paper towel and let the finished piece dry. She enjoyed her painting for a long time - until she decided the brush is not fast enough and used her hands on the wet bright towel instead. To make the ice boats, I prepared card stock circles cut to the diameter of a cup with holes in the middle to insert drinking straws (pictured below). We inserted the circles into the cups with the remaining colored water and let them freeze overnight. When the cups were frozen and towels dried, I assembled our ice boats. My Firefly loved them and played with them inside for a while. We talked about colors of the sails and boats, and the transformation of water into ice. Does the ice sink or float? How about a straw and a paper towel? Can ice turn back into water? There are so many questions that can be taken outside into a nice summer heat! 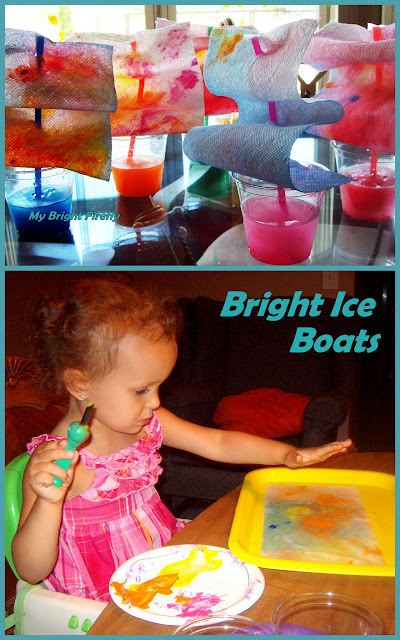 Our bright ice boats did not stay upright for a long time, but were lots of sensory fun and exploration for the little hands! Here are the straws left behind - and they still are fun to play with! And, of course, the water transfer activity: the cups were favorite backyard toys for several days after. There are so many creative ways of using them! Our bright ice boats brought us many happy discoveries and hours of play: guided and free. We should do it again!